Two weeks ago I decided to change up my classroom layout by moving the desks from separate rows into table groups of four. It sparked an immediate conversation when students walked into the room and it changed the classroom dynamic immediately. After each class, I asked the students to give me feedback on the new layout and what they thought of it. I got very positive feedback and it was interesting to hear the students’ perspective on classroom arrangement. This got me thinking about how to better utilize the classroom space and mix things up more often. I have tried small things before and it’s interesting to see how students notice these “non-traditional” changes. For example, this year I got rid of the standard teacher desk (the bulky, oversized metal desk of authority that all teachers in my school have) and opted instead for a small, ordinary table. Many formers students have returned to say hello and all have asked me why I got rid of my “teacher” desk. I didn’t think anything of it at the time but it’s obvious that it sticks out to students when a teacher changes things up. So then I added in a few stools and some chairs with cushioned seats. I just put them along the perimeter of the room and when I paired students up I suggested they take the seats to get by their partner. Then students took notice and started to sit in these seats just to do regular tasks like the warm-up activities or to take notes from the board. It didn’t bother me but I noticed that students who did this were happier just moving and having a new seat. After noticing these things and then after a conference I attended, I thought it was time to switch it up even more and that’s when I got the idea for arranging the desks so that they resembled tables. I like the new arrangement but then I noticed how for some activities it actually is more of a hindrance to learning. This helped me realize that the classroom space has to have purpose for the work that students are doing. It didn’t occur to me in the past few years that maybe it’s good to change around the layout based on what the learning necessitates. 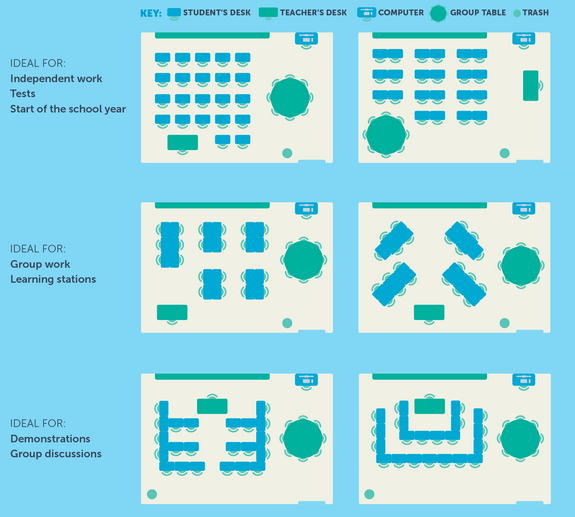 How can classroom design improve learning? What are the cutting edge trends in classroom design? Are there simple, inexpensive ways to improve the classroom? I’ll continue experimenting with what I already have in my classroom to figure out answers to these very questions. And I’ll keep asking my students for feedback, because as teachers we should ask the learners what sort of environment will best support them.